I supplicate the three jewels of refuge. Like an etching on a rock. You gullible guests, hearken to this! 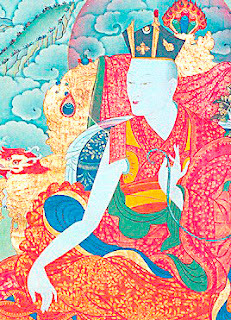 Generally, the suffering of samsara is inconceivable. Contemlpating this again and again, I burst into tears. Their minds are pierced by a shaft of suffering. Now is the time for us to practice the divine dharma. And set out the path of liberation, which ripens and frees many beings. But these days are the age of the five corruptions. And the weights and measures of deceit are held in hand. When the faults of the material world begin to show. Are the fruit of completely ripened karma. That everyone experiences does not fade away. How sad, it will naturally wilt. It is very stupid not to practice the holy dharma. And the seasonal rains come is uncertain. Is certainly too late, O son of noble family. Will become old men before you know it. Still, you are planning to stay around. And consume all the precious bodhi trees of virtue. For the rock bottom of hell. This makes me utterly depressed. In the saddharma-smrtyupasthana-sutra and elsewhere. Everything is the natural expression of emptiness. There is not a moment's opportunity for happiness. The realization of things as they are.